Stay focused on your inspiring vision of a better self. It takes tremendous courage, will, concentration and self-compassion to break old habits and learn new ones. List the downsides of not adopting a new habit. List key benefits of acquiring a new habit and visualize yourself enjoying these new benefits. Engage your subconscious mind. All habits are operated by the subconscious mind that works much faster than your conscious mind. Habits are what do without having to consciously think about it. While you are consciously aware of only your own thoughts, your subconscious mind is paying attention to the other things, including your habits. By daily practice, you can imprint the right programming and learn a habit within a matter of weeks. Any thought you repeat over and over, anything you do over and over – program into your subconscious mind. When you learn to imprint the right programming into the subconscious, you will make your actions effortless and natural. Commit to practice a new habit daily for at least three weeks. Consistency and high frequency is critical if you want to make a new habit stick fast. Allocate three weeks for efforts. 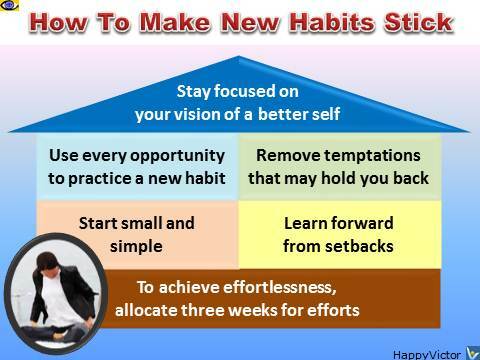 Develop a new habit by practicing it daily for at least three weeks to make it nearly automatic and easy to maintain. Start small and simple. A too complex task may demotivate you. You can create a new habit with a small amount of initial discipline. For instance, if you wish to exercise or meditate for an hour a day, first make the habit to do so for ten minutes and build on that. Look for and use every opportunity to practice a new habit as much as possible to make it automatic. Challenge yourself to live a different way. If you can make it through the initial resistance-to-change phase, your new habit becomes much easier to sustain and run on autopilot. If you like competition or need a company, find a buddy who will go along with you, or spend some time with people who model the habits you want to mirror. Remove bad temptations from your mind and environment. Make it difficult for old habits to tempt you, especially in the first thirty days Restructure your environment and adequately replace the lost needs with the desired ones. For instance, if you wish to eat healthy, remove unhealthy food from your kitchen and stay away from fast food restaurants. Learn forward from setbacks. Try your best, but don’t expect all your attempts to change your old deep-rooted habits to be successful immediately. Your ultimate success largely depends on how you think about failure. Be a → successful learner – learn from failures and setbacks. Just as you develop habits in your behavior, you also develop habits in your thoughts. If you treat every situation as a learning opportunity, you will continually move ahead. Develop a passion for your new habit.